Depending on where you live, these pillowy little cake squares dipped in chocolate and unsweetened coconut go by two names. In Ohio they are known as Coconut Bars, and have been a Cleveland tradition for decades. Go into almost any bakery and even some grocery stores and you will find them prominently displayed alongside the cookies and brownies. But try asking for them outside of Cleveland and you'll be met with a blank stare. They don't exist. That is unless you live in Australia, where Lamingtons, as they are named, are a popular national dessert! Now if you live somewhere between Cleveland and Australia and want to experience their loveliness, this recipe, adapted from David Lebovitz, makes them accessible to everyone. They are delicious and addictive. Line the bottom with parchment paper and butter the paper. In the bowl of an electric mixer, lightly beat the eggs, salt and sugar together. 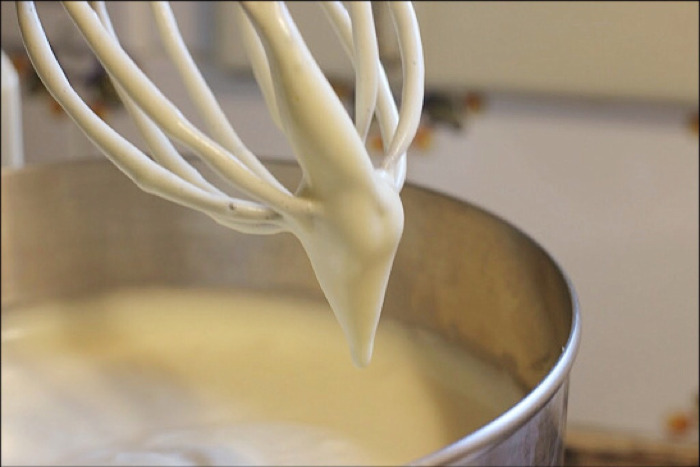 Once incorporated, turn mixture to high and whip for 5-10 minutes until the eggs are very thick and form a ribbon when you lift the whisk. Sift the flour onto the mixture and using a whisk, fold into the batter. Once incorporated, gently fold in the butter. Pour into cake pan and bake for 25-30 minutes, or until the edges pull away slightly from the pan. Unmold the cake onto a cutting board and remove the parchment paper. Trim the ends and either cut the cake into 16 squares or use a cutter. Refrigerate or freeze the cake while you make the icing. They will be easier to dip into the chocolate when cold. To make the icing, melt the chocolate, butter, and milk in a bowl placed over simmering water. Remove from heat and whisk in the powdered sugar and cocoa powder. If too thick, you can add 1-2 tablespoons of boiling water. Prepare to dip the squares. Place coconut in a small cookie tray. 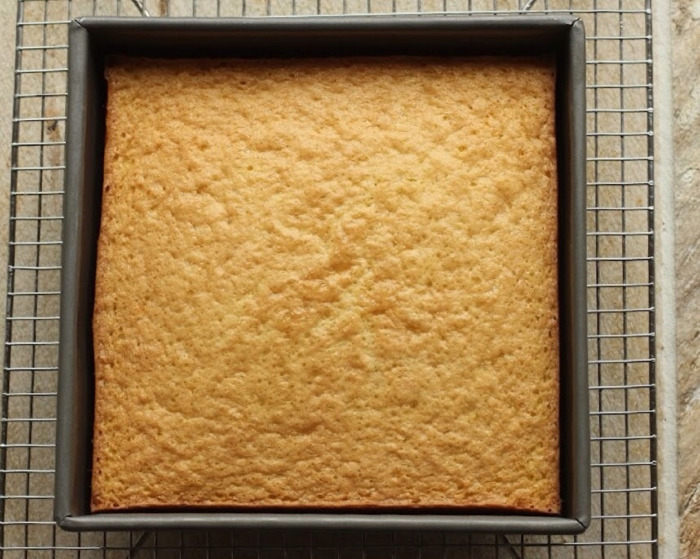 Place a cooling rack over a large baking sheet to set the squares after dipping. It’s a bit messy so I like to keep a bowl of water and a towel to keep my hands clean. Remove cake from the freezer or refridgerator. Working 2 at a time using your hands, dip in chocolate to cover all sides, then sprinkle with coconut. Remove carefully using 2 small forks and allow to set on a cooling rack. In the bowl of an electric mixer, lightly beat the eggs, salt and sugar together. Once incorporated, turn mixture to high and whip for 5-10 minutes until the eggs are very thick and form a ribbon when you lift the whisk. Fold in vanilla. Sift the flour onto the mixture and using a whisk, fold into the batter. Once incorporated, gently fold in the butter.Pour into cake pan and bake for 25-30 minutes, or until the edges pull away slightly from the pan. Allow to cool on a baking rack. Unmold the cake onto a cutting board and remove the parchment paper. Trim the ends and either cut the cake into 16 squares or use a cutter. Refrigerate or freeze the cake while you make the icing. They will be easier to dip into the chocolate when cold.To make the icing, melt the chocolate, butter, and milk in a bowl placed over simmering water. Remove from heat and whisk in the powdered sugar and cocoa powder. If too thick, you can add 1-2 tablespoons of boiling water.Prepare to dip the squares. Place coconut in a small cookie tray. Place a cooling rack over a large baking sheet to set the squares after dipping. It's a bit messy so I like to keep a bowl of water and a towel to keep my hands clean.Remove cake from the freezer or refrigerator. Working 2 at a time and using your hands, dip in chocolate to cover all sides, then sprinkle with coconut. Allow to set on a cooling rack.